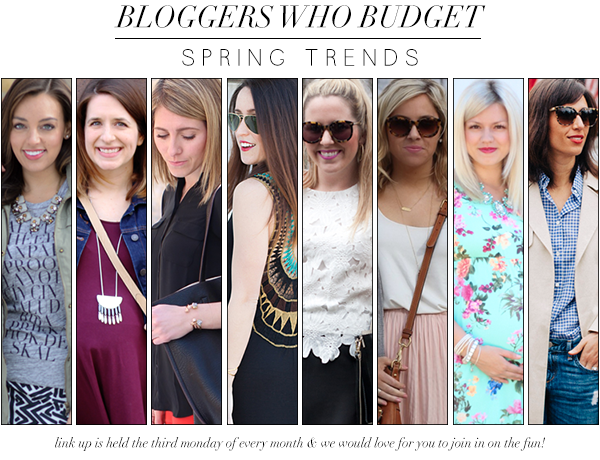 This month the Bloggers Who Budget are back showing our favorite Spring Trends for under $75! Check out how you can link up below! My favorite spring trend? Dramatic maxi dresses. I love that I can wear this PB&J Boutique dress right now with leather accents, & also am excited to peel off the layers exposing this fun back detail when the weather heats up. Looking to add some fun maxi dresses to your closet? PB&J Boutique loves Here&Now readers so much that they are offering 20% off your entire purchase using code "JESSICA20"! *I was provided a complimentary subscription to Rocksbox, but am truly hooked! Sign up using my code and get your first month free! "HEREANDNOWXOXO"
Want to join the BWB link-up? The third Monday of each month at 8 AM EST, you can head to any one of our blogs to link-up your post. We kindly ask that you please follow all of our blogs (via Bloglovin’, Twitter, Facebook, Pinterest or Instagram!). Also, please provide a link to this in your post or add the button below to your blog. If you tweet, please use the hashtag #BloggersWhoBudget. OMG! Love love love love that maxi! Oh wow! You look gorgeous in this outfit and the opening on the back of your dress is impressive! The back detailing of that maxi is amazing! And love how you styled it! THE BACKKKK be still my heart!! Spring dressing is one of my favorites - cause we get to wear the best of everything! I love a basic black maxi dress too, but the detailing on the back of yours is gorgeous!! I love everything about this look, and bonus that it's affordable, too. I absolutely love the back of this dress! What a unique piece. Love the outfits! Beautiful photos.